"That's a plan - to do an 'official bootleg' series with the band someday." "And it was all right..."
The Velvet Underground - "Bootleg Series Volume I : The Quine Tapes"
The Bootleg Series Volume 1: The Quine Tapes is an official three-disc set of previously unreleased Velvet Underground live material taped in 1969 by Robert Quine in St. Louis and San Francisco. 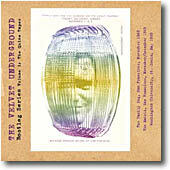 This set is the first installment in a series of live recording by The Velvet Underground. Universal Music Group has yet to reveal information on possible future volumes. The set is available since October 16th 2001. It was initially scheduled for August 28, 2001, then September 18, and finally bumped to October. The time-honored tradition of a fan taping a live concert of a favorite band takes an unusual twist with the three-CD set The Velvet Underground Bootleg Series, Volume 1: The Quine Tapes (Polydor/UME), released August 28, 2001. Robert Quine was not only a fan of one of rock's most influential and legendary bands when he recorded the group in 1969 but the guitarist later became a founder of punk pioneers Richard Hell & the Voidoids and from 1981-1985 recorded and toured with Velvet Underground leader Lou Reed. He's also recorded with Brian Eno, John Zorn, Lloyd Cole, Matthew Sweet, Tom Waits and Marianne Faithfull. An informed listener, in 1969 Quine became a friend of the band and was sometimes asked to play back a particular song from the previous night. He was also savvy enough to take his original cassette tapes and transfer what he considered the best performances onto reel-to-reel tape. Those four hours comprise the digitally compiled and remastered The Quine Tapes. All but one of the tracks are previously unreleased ("Rock And Roll" appears in a different mix on Velvet Underground Live 1969). Recorded at a large hall (The Family Dog) and a small club (The Matrix) in San Francisco, and the basketball gym at Washington University in St. Louis, the collection illustrates the band in both spacious and intimate environs. The Quine Tapes find The Velvet Underground just after John Cale's exit and just before the band's final studio album, 1970's Loaded. With Reed (guitar, lead vocals), Sterling Morrison (guitar, vocals), Doug Yule (bass, organ, vocals) and Maureen Tucker (drums, vocals), the group is at the height of its powers as it spans the Velvet Underground opus, from "I'm Waiting For The Man" and "Heroin" to 24-, 38- and 28-minute versions of its signature tune, "Sister Ray." Also heard are scintillating performances of "Foggy Notion," "What Goes On," "White Light/White Heat," "Ride Into The Sun," "Follow The Leader," "New Age," "Too Much," "I Can't Stand It," "Some Kinda Love," "Femme Fatale," "After Hours," "I'm Sticking With You," "Sunday Morning," "Venus In Furs," "Over You" and "Black Angel's Death Song." The Velvet Underground heritage of underground tapes plus a series of archival packages helped spread the band's notoriety in the '70s and '80s (the group was inducted into the Rock And Roll Hall Of Fame in 1996). But, in the end, The Quine Tapes are about a fan and a band. As Quine writes in the package's liner notes, "Listening to this stuff all these years later, I'm ultimately the same fan I was in 1969." This is a series of unsurfaced live tapes recorded by Robert Quine in May 1969 in Washington and late 1969 in San Francisco. Those tapes have been mentioned in the late Lester Bangs book and by Robert Quine himself in different interviews. Robert Quine: Well, I brought a friend out to see them [The Velvet Underground]. I was too terrified to talk to Lou Reed - he was friendly enough though. I was at the Matrix shows in San Fransciso where 1969 was recorded. They had shows on some weeknights with two or three people in the club. I was one of the people, so they knew me and got to be friendly with me and I taped them - I have hours of cassettes of them. A lot of their best stuff from those gigs never came out. One night he did 'Waiting For My Man' where he totally improvised new lyrics. Robert Quine: By the time I saw the Velvet Underground in 1969, I was already totally influenced by their albums. But seeing them live was inspiring. I had moved to San Francisco that year, and in November they played there several weeks. Fame-wise, they were hardly on a Stones/Beatles level. That�s unfortunate, but it made it not so difficult to meet them, hang around with them, etc. They were relatively happy, getting along well. And Lou Reed was going through an especially creative period. He was writing a lot of new songs, including "Sweet Jane," "New Age," and "Ride Into the Sun." Each night he'd improvise new lyrics, on the spot! And best of all, I got to spend a lot of time talking about music (influences, new directions, etc.) with Lou Reed. I went to all the performances and taped them on my cassette recorder. Between sets, I'd hang around with them in the dressing room, sometimes playing them cassettes of stuff they'd done that night. It was a real privilege - something I'll never forget. Robert Quine followed The Velvet Underground during 1969 at the Washington University in Saint Louis, the Family Dog and the Matrix in San Francisco. He taped them at least a dozen times on a Sony cassette recorder with a hand-held microphone. Robert Quine compiled from those recordings a 4-hour reel of his "Best Of '69". There are complete shows, somewhere in Quine's mess of cassettes. These have not been looked at since the transfer some 30 years ago. Who knows what state they might be in? The Best Of reel was the source used to master The Bootleg Series Volume 1 3-CD set. Those tapes and their forthcoming release have also been recently discussed in Eric Veillette's interview with Robert Quine. Robert Quine - born December 30, 1942 in Akron OH - first achieved recognition for his guitar work as a founding member of Richard Hell and the Voidoids, one of the New York punk scene groups of the late 70's. From 1981 until 1985, he recorded and toured extensively with Lou Reed. Since then, he has recorded with numerous artists including Brian Eno, John Zorn, Lloyd Cole, Matthew Sweet, Tom Waits, and Marianne Faithfull.